In addition to crafting hand made outdoor goods, we host a range of workshops and events designed to engage a new generation of outdoors people with nature through creativity, fun and adventure. 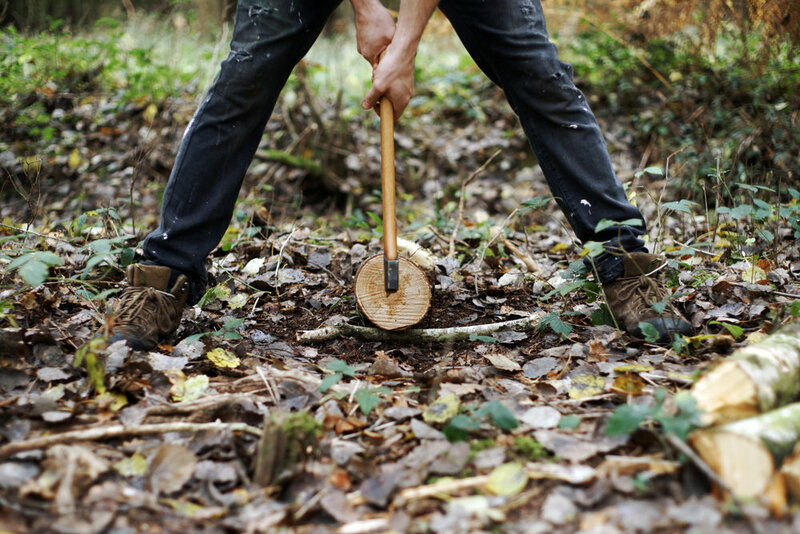 All workshops take place on our beautiful semi ancient woodland site, just over an hour away from London. Workshops can be arranged for small groups and individuals, please contact Emma to arrange dates and details. If you’re a brand or company seeking to make adventure and nature connection part of your next event, see our recent case studies for examples of ways in which we can work together. Whether woodcarving, nature journalling, axe crafting or camp cooking, all our workshops have a boiling kettle of coffee over the fire at their heart. 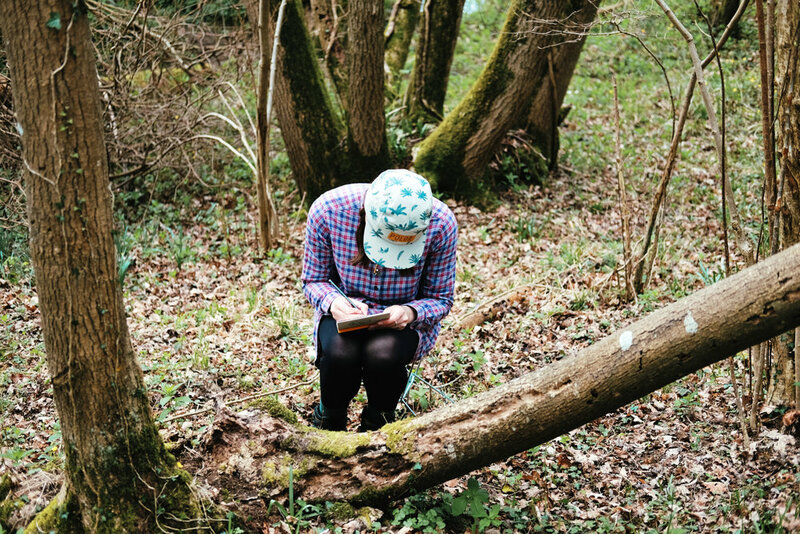 Step away from your computer screens, forget about the daily grind and join us in the woods; make something with your bare hands, fell a tree, light a fire, get blisters, muddy boots, woodsmoke in your hair and reconnect with nature in a meaningful way. A whole day in the woods in a relaxed, creative, environment learning the foundations of woodcarving, this is our original and most popular workshop. 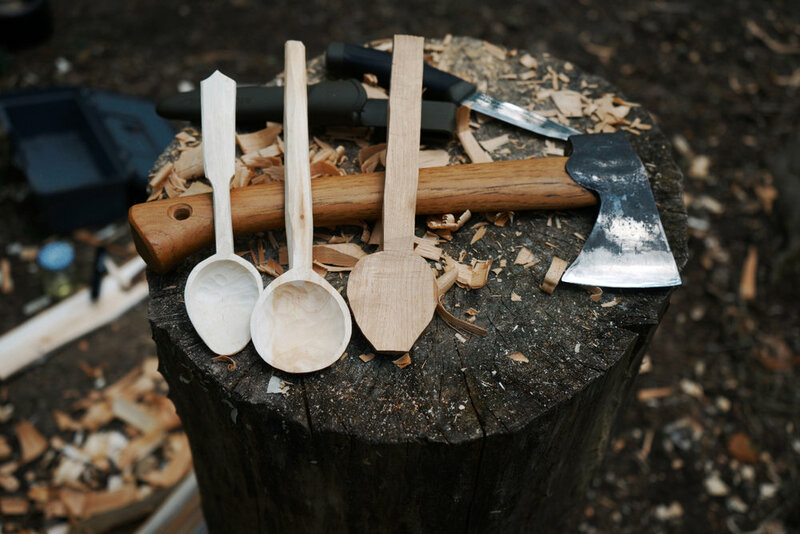 Via the simple act of carving a spoon from green wood with hand tools, we teach not only the practical skills required to safely and efficiently work with wood in the great outdoors but also share our woodland wisdom and reveal some of the secrets of the forest. We’ll be running this workshop at our base in West Sussex on Saturday, April 27th and places are available here! The Woodland Basecamp Workshop aims to teach all the skills needed to spend a whole day comfortably in the woods. For 8 years we have been living in a woodland and have learnt the most from simply staying put in one spot, allowing nature to reveal itself to us. We share how to set up camp, using lightweight tarps and clever knots, find and prepare firewood, teach firelighting using natural tinders, cook food over fire and carve useful objects with simple tools. Most of all though we teach how to switch on your senses and become more attuned to the rhythms of nature, making for a richer, deeper outdoor experience. An enduring symbol of freedom, wilderness and adventure, the axe is probably the most useful tool available to the outdoors person. Whether hiking through forested terrain, staying in a cabin or simply heating your home with wood, the axe can provide everything needed to be comfortable. Held over the course of two days, the Axcellent Adventure Workshop is a thorough and fun introduction to the safe and efficient use of this versatile tool. We teach everything from sharpening and maintenance to tree felling and woodcarving and provide hot, hearty campfire cooked food throughout the weekend making for a truly memorable adventure.